War Thunder Game Hub: Operation Sealion Complete Campaigns now avail! Welcome to the completed Operation Sealion Mission Packs for Cliffs of Dover! There are two packs, each comprising 28 missions, one created from an RAF victory perspective, and one from a Luftwaffe victory perspective. However every mission in the BoB Game Hub Sealion mission packs is designed with multiple flyable aircraft available to players flying either RAF or Luftwaffe. Wherever practical, mission design includes both ground starts and airstarts. Mission design takes an 'open battlefield' approach - the player will be given an objective, but once airborne, you have full freedom of operation to either prosecute the assigned target, or attack other targets of opportunity. These missions are minutely based on the notes from the Royal Military Academy Sandhurst wargame conducted in 1974 to simulate a September 1940 invasion by Germany. In this exercise, each side (played by British and German officers respectively) was based in a command room, and the actual moves plotted on a scale model of SE England constructed at the School of Infantry. The panel of umpires included Luftwaffe ace Adolf Galland, Admiral Friedrich Ruge, Air Chief Marshal Sir Christopher Foxley-Norris, Rear Admiral Edward Gueritz, General Heinz Trettner and Major General Glyn Gilbert. The main problems the Germans face are that a) the Luftwaffe has not yet won air supremacy; b) the possible invasion dates and resupply are constrained by the weather and tides (for a high water attack) and c) it has taken until late September to assemble the necessary shipping. The combat takes place on a narrow front, on land, sea and in the air. I have aimed for nothing less than 'epic' with these mission packs, and hope they leave you with a feeling of reliving an alternate version of history. PS There have already been more than 3,000 downloads of the earlier releases of the partly completed Sealion missions (thanks all!). The full pack adds another 10 missions, and alternate endings! Q. I ran the install program but the missions don’t appear in my Single Missions menu in the game! A. The install program can automatically install all the required files into your Single Missions folder and menu. When prompted, you should browse to your default Cliffs of Dover folder, usually 1CSoftClub>IL2SturmovikCLiffsofDover. If you do not choose a folder, the files will be placed into your My Documents folder for you to install manually. To manually install these missions, simply copy all files into your CoD Single Missions folder, usually 1CSoftClub> IL2SturmovikCliffsofDover> missions> Single. Q. What is the difference between the RAF mission pack and the LW mission pack? A. From about S-tag (Sealion Day) +8, events diverge between the two mission packs – the two mission packs have different endings! The RAF pack follows events from the RAF perspective and the default flyable aircraft are usually RAF aircraft. 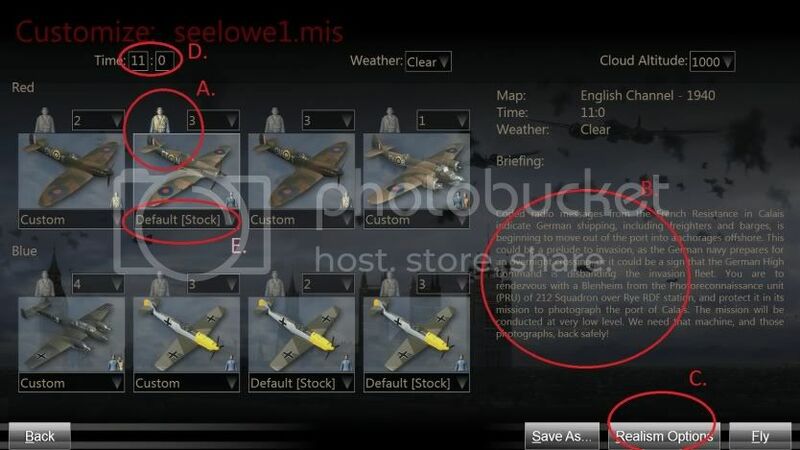 The Luftwaffe pack is put together with the default flyables as Luftwaffe. Of course, because these are single missions, the player can fly any flyable aircraft, on either side, from the CUSTOM menu. EVERY player flyable aircraft in these missions has its own mission briefings and objectives. Q. What types of missions are featured? Q. I want to fly for the Luftwaffe but the default aircraft seems to be RAF (or vice versa). Can I change the default? A. Yes! The reason this pack has been created as single missions, rather than a campaign, is so that you can more easily customize to your heart’s desire, no matter whether you install the RAF victory or LW victory versions. On the mission briefing page, click the CUSTOM button. Then see below for what you can customize. Q. I want to change the default aicraft eg fly a Spitfire rather than a Hurricane / an Emil rather than a Bf110. Can I? A. Yes! If the aircraft is player flyable, simply click CUSTOM (see above) at the briefing screen then click on the picture of the pilot for the aircraft you want to fly. You can change this aircraft to whatever flyable aircraft you want by clicking the picture of the aircraft. (A. below). Check the briefing to see what mission this aircraft is assigned. (B. below). A: To change time of day or weather, enter new values at D. To change loadout click the ‘default(stock)’ or custom loadout indicated in A. To change realism values, click C.
Q. How can I see what the mission or target is for every aircraft in the mission? This will help me decide which one I want to fly. A. Check the mission and targets assigned to each flight at B. When you are airborne, use the map and enable waypoint icons to see which route you are assigned to patrol. You do not have to follow the assigned route, but the missions are scripted for aircraft/players to follow the waypoints as ordered, which was RAF and LW airforce doctrine at the time unless fighters were assigned a ‘free hunt’. Q. I want more aircraft in the missions, or, my PC can’t cope with the number of aircraft in this mission! A. You can increase the number of aircraft in each flight in the drop down box next to the pilot (see A.). This may degrade PC performance. You can decrease the number of aircraft in each flight (or zero it completely) the same way to increase PC performance. It is suggested you start by decreasing ALLIED aircraft to preserve the focus of the integrity of the sortie you are flying yourself. Ground targets such as trains, guns, vehicles or stationary aircraft, as in real life, are hard to find and hit. If it helps, fly ground attack missions as wingman, and follow your leader in! (You can set your aircraft to fly as wingman in the Full Mission Builder). Q. My flight appears to have no landing waypoint… where do I land? A. Some flights, especially player flights, are not assigned landing waypoints, to ensure they stay in the battle area. It is up to you as the pilot to judge when and where to land, but here is a list of the main home airfields, at various stages of the campaign. Q. My flight is out of action / has run out of targets/ I have run out of fuel and ammunition, but I can see other aircraft are engaged on the battlefield. Can I jump into the cockpit of those aircraft and keep fighting? Q. I prefer campaigns, rather than single missions. Why don’t you compose these missions into a campaign? Of course there is nothing to stop you compiling these missions into a campaign yourself - if you do, please share! Q. I like random elements in missions, like randomly spawning enemies and event triggers. Why don’t you incorporate those? A. Because they require scripting, which requires coding abilities, which I don’t have. I have to work within the limits of what the full mission builder basic functionality allows sorry. But I have compensated this by building a world of such detail on the ground and in the air that I hope the missions remain interesting anyway. Each mission can be played from several points of view, and because of the large number of sorties and targets in each mission, they never play exactly the same way twice. Q. I have found an error or fault in one of your missions, can you fix it? A. If I can, I will! Just post details of the problem in a comment on www.bobgamehub.blogspot.com or leave me a message here on the SimHQ CoD forums, or Airwarfare forums. I can usually fix and upload a new version of a mission within a few days if there is an error. Q. These were OK! Do you have any more? I had a look at the installation files and saw that in the LW mission pack, there are three additional files which are not included in the RAF mission pack: sealion1.briefing sealion1.mis and sealion2.mis. Are they needed for the LW mission pack somehow or are they just obsolete? Thanks! You are a genius (actually, I am just thick). I tried for the longest time to find a way to get the missions to appear in the right order in the CoD menu and of course, I should add a 0 to the first missions! Thanks! I have updated both the downloads immediately. And yes, those extra files are obsolete, I have also deleted them. Thanks v much for your help in tidying this up! I downloaded the two files but my Norton removes them instantly, the reason is "WS.Reputation.1" (more information at: http://securityresponse.symantec.com/security_response/writeup.jsp?docid=2010-051308-1854-99). I'm sure it is due to something minor and I would appreciate a review of files to enjoy them even more securely. PS I have had more than 1000 downloads of these files and none report viruses, so I'm pretty sure the problem is not that.